Ola Aina joins AC Milan duo Lucas Paquetá, Franck Kessié in the Italian Serie A Team of the Week. 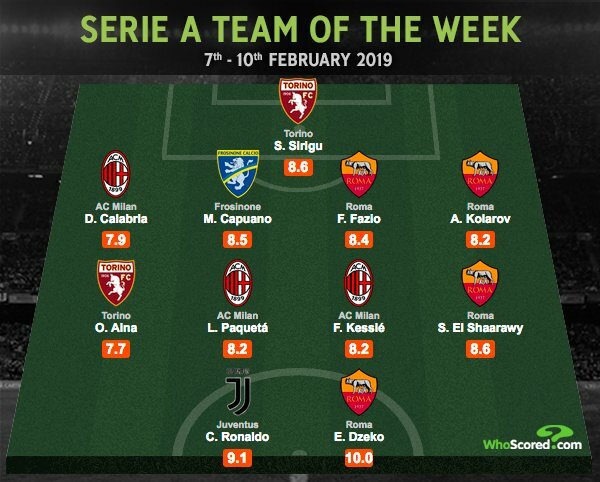 Super Eagles defender Ola Aina has been included in the Italian Serie A Team of the Week following his impressive performance for Torino in their 1-0 win against Udinese in an encounter played on Sunday, February 10. The 22-year-old scored the only goal of the game in the 31st minute through an assist by Cristian Ansaldi to give Torino all three points against Udinese. For his match-winning performance against Udinese, Aina was rewarded with a place on the Team of the Week. Aina who was deployed at wingback in the encounter was included in a midfield role alongside AC Milan duo Lucas Paquetá, Franck Kessié and AS Roma’s Stephan El Shaarawy. Aina was sensational in the matchday 23 encounter against compatriot William Troost-Ekong at the Stadio Olimpico Grande Torino. The Super Eagles star was credited with 80 touches against Udinese, made a total of three interceptions, four clearances, and three tackles before he was substituted by Lorenzo De Silvestri in the 94th minute. Other statistics of Aina include one key pass, a passing accuracy of 82.2 percent, two shots on target and winning two aerial duels. Aina who is on loan at Torino by Premier League giants Chelsea was given a 7.7 rating by Whoscored and has continued to develop under the guidance of Walter Mazzari. The youngster is expected to retain his starting spot when Torino takes on Napoli in their next league fixture scheduled for Sunday, February 17.